Planting gorgeous sunflowers is one of the easiest ways to provide food for birds in your garden, and they’re excellent fun to grow. Many of us feed the birds, which is great, and helps them make it through difficult times of year. But using your garden to 'produce the goods', rather than shipping everything in from a distant field, is really fulfilling and better for your carbon footprint. It’s a great activity for kids, too – consider planting several sunflowers and having a race to see who wins. Sunflowers are useful plants to have in a wildlife-friendly garden. Bees, and sometimes butterflies, love the nectar and feed on the flowers when they’re in full bloom. Then greenfinches and goldfinches will munch on the nodding, drying seedheads. Buy your sunflower seeds. There are all sorts of varieties available, with some that can grow huge, up to three metres or more. These are great fun to try and can produce the most seed, so try a variety like 'Russian Giant'. Sow your seed. You can sow the seed directly into the ground in late April or early May, but we recommend that you sow them in pots in late March or April to keep them safe from slugs and snails until they are planted out and to give them a head start. Fill a 7.5 cm pot (or slightly larger) with peat-free compost. Poke one seed per pot down into the compost. Cover with about 1 cm of compost, and then water. Place in a warm position. Use a propagator lid if you have one. Or you can make your own mini cover to protect your plants by cutting the top off a fizzy drink bottle. Plant out in a sheltered position once the risk of frost has passed. Sunflowers like to grow in a rich soil. Protect them as best you can from slug and snail damage, by using copper bands, broken eggshells, or any other organic slug control methods. You might need to do an evening slug patrol to keep them from eating your new shoots. Stake and water. As your sunflowers grow, you may need to tie them to canes to stop them blowing over. Keep well-watered through the summer as your little seedlings turn into giants. What to look for. Sunflowers are useful plants to have in a wildlife-friendly garden. Bees, and sometimes butterflies, love the nectar and feed on the flowers when they’re in full bloom. Then greenfinches and goldfinches will munch on the nodding, drying seedheads. 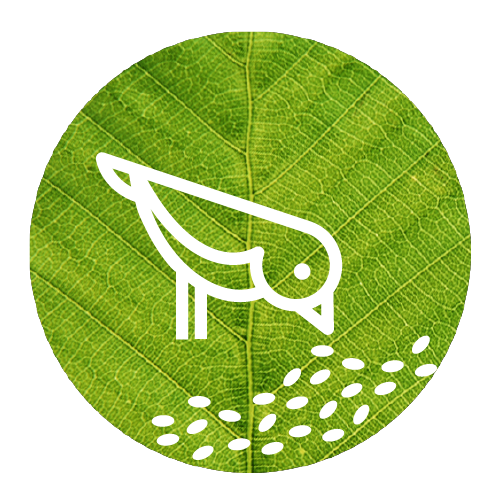 Here’s how to grow food that will bring birds flocking.